Arrive hungry and experience a variety of flavors from local hotspots in Portland, Oregon. Learn about the bustling culinary scene as well as the “localvore” philosophy that drives it. 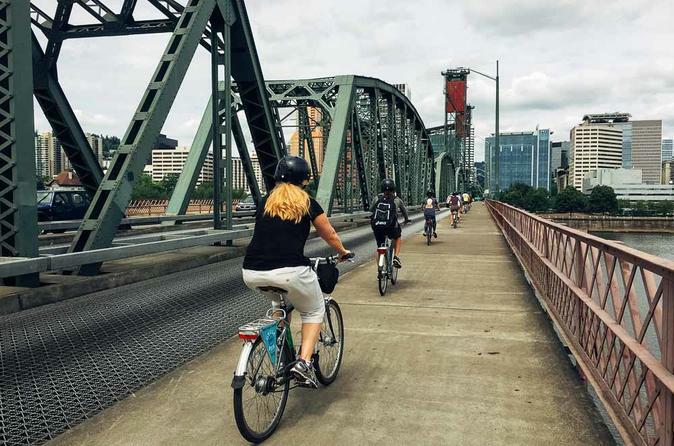 Indulge your taste buds and ride with us on this classic Portland experience. Sip and savor some of Portland’s finest roast at Cup & Bar. With dedication to more than fair trade, primary bean sourcing from women-owned cooperatives, and a dedicated passion for creating the best coffee in town, you can’t miss this must visit shop. Also, did we mention they make their own chocolate too? After a rest at Cup & Bar, we then breeze through distinct, and historic neighborhoods towards some of the best food cart creations in town. Portland is serious about it’s food and is home to many epic food cart pods – dishing up slow food delicacies at incredible value. With over 400 Food Trucks in Portland the competition is fierce, bringing the quality and creative delivery to delicious new heights. We take you to the pod where it all started, down on SE 12th and Hawthorne where we’ll experience samples of Portland’s rising star Chicken and Guns, as well as Potato Champion. Journeying through more craftsman neighborhoods, our last stop indulges your sweet side, topping the journey off with a visit to Fifty Licks (Friday through Sunday), home to some of the best ice cream in the city, these folks focus on creating wonderful flavors from their own handmade ice cream base, making the taste unique and individual from start to finish. On Monday through Thursday we visit Alma Chocolates, a Portland icon and host of delicious hand dipped bon bon's. Their combination of single origin cocao paired with locally sourced flavors make this an excellent way to round out the afternoon. Vegan and Gluten Free options are available at each stop. (Please note: Celiac options are very limited) If you are concerned about your ability to participate due to a dietary restriction, please contact us prior to placing your booking.